Now the Internet of Things has moved to my toilet. I wonder why you would need to have your smartphone app for your toilet. A luxury toilet controlled by a smartphone app is vulnerable to attack, according to security experts. 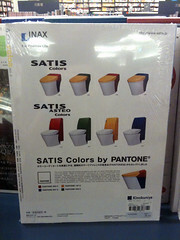 Retailing for up to $5,686 (£3,821), the Satis toilet includes automatic flushing, bidet spray, music and fragrance release. “An attacker could simply download the My Satis application and use it to cause the toilet to repeatedly flush, raising the water usage and therefore utility cost to its owner,” it says in its report.